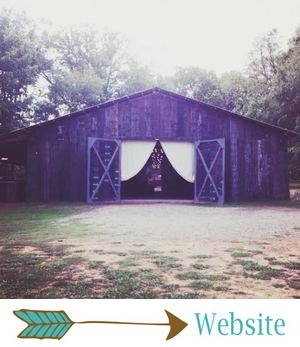 As a barn wedding venue, we do a lot of rustic weddings. It's just the perfect theme for a barn setting! We're not complaining at all... We never get tired of rustic weddings! However, when a couple requests a more glam, elegant theme, we get totally pumped! We don't do super glam weddings often at The Barn, so it's always extra fun to get to work with lots of bling! This wedding was one of our several purple weddings of 2016, and it was full of glamorous, romantic details. It was such a treat for our team! Manda Standridge from Photos by Manda is one of our favorite vendors to work with! She takes our staff photos, and we're always thrilled when couples choose her as their photographer! She captured Maudie and Matt's wedding day perfectly... from all the details to the moments they'll want to remember forever! Maudie and Matt were married at The Barn at Twin Oaks Ranch on October 22, 2016. Their color palette was an elegant combination of purple, silver and white. "It was just simply the perfect colors we thought that matched us," Maudie said. Their decor was romantic, with glam touches throughout! Maudie's bridal gown came from Low's Bridal, and it went flawlessly with their theme! A ballgown (with the prettiest bling) is perfect for a glam, romantic wedding, and it was gorgeous on her! I had to include these photos from her bridal session, because it was seriously the dreamiest bridal session ever. I mean, really... this is a fairy tale! Maudie's bridesmaids wore floor length dresses (from Dressbarn) in the prettiest shade of purple. They also wore the most gorgeous BOOTS! Matt wore a light gray tux with a purple vest and tie, and his groomsmen wore dark gray tuxes with silver vests and ties. Such an elegant bridal party! Y'all, have I mentioned how much we LOVED all the amazing purple from last year?! Purple flowers are some of the prettiest! 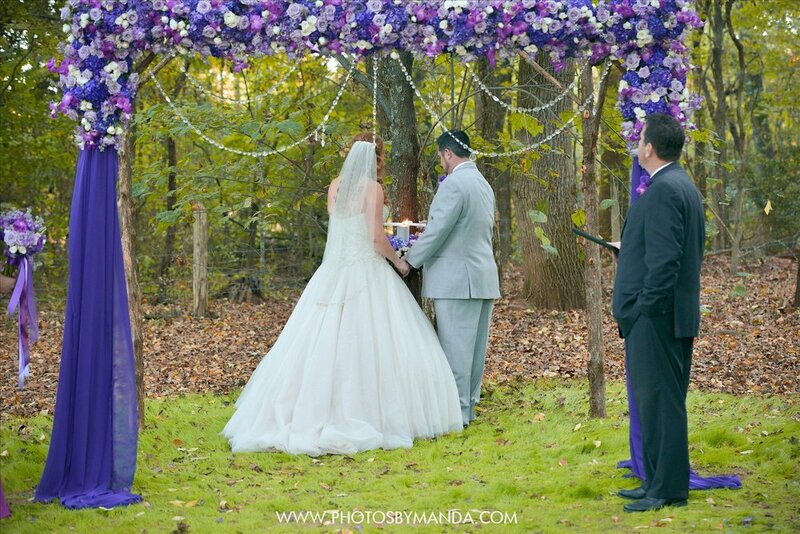 Maudie's florals included flowers in several shades of purple and a touch of greenery. Her bouquet had cascading purple ribbon, which was elegant and stunning! Maudie and Matt's ceremony decor was full of eye candy! There were several bold details, and all combined, they made a HUGE, fabulous statement! Their aisle was gorgeous, with a pink and white petal design, purple fabric, and hanging glasses with candles. Their altar was unforgettable! It was draped with purple fabric and covered in tons of flowers and hanging crystals. So glam! Maudie said one thing she would never forget about her wedding day was seeing her dad as she walked out of the bridal suite, knowing she was about to go down the aisle and marry the love of her life. Matt said he'll never forget "how beautiful Maudie was coming down the aisle and Ryder winking at me as if everything would be okay." These two chose not to see each other before their ceremony, so the moment Maudie walked down the aisle was emotional for both of them! We love a groom who gets choked up when he sees his bride walking down the aisle! Their ceremony was sweet, full of emotion, and so very special! Since Maudie and Matt didn't have a first look, they had all of their portraits taken following their ceremony. How romantic are these?! Maudie and Matt's reception began with a cocktail hour on the lawn, and it was tres chic! The reception was held inside The Barn, and it was full of fabulous purple details. Maudie said her favorite details of the day were her reception tables... they were perfect! They included elegant purple table runners, beautiful purple florals, and purple place settings with custom menu cards, just to name a few of the amazing details! 2016 was the year of the simple white cake, but Maudie and Matt went for the exact opposite! Their cake was so unique and fun! It was covered in black and white photos of the couple, and finished off with purple flowers and a cute custom cake topper. We also loved the Marine Corps groom's cake! Yet another thing to love about this gorgeous wedding: all the cute kiddos running around! Maudie and Matt had the perfect reception with their family, friends and all their little guests. They shared their first dance as husband and wife, danced with their parents and their sweet kids, cut their cake, listened to several sweet toasts, and had such a fun dance party! Oooh, and this has to be one of my favorite wedding cake pictures ever. Isn't this how we all feel about wedding cake?! Maudie and Matt's getaway was just as romantic and beautiful as their rest of their wedding! Their guests tossed rose petals as they left The Barn... The prettiest getaway photos ever! The newlyweds ended their night inside The Barn with their sweet kiddos, playing and sharing one final, sweet dance together. The perfect way to begin their new lives as husband and wife. <3 Then they headed off for a romantic mountain honeymoon! "We went to Vail, Colorado and rode horses through the mountains and did a lot of much needed relaxing," Maudie said.